Kaylee walking on the Petrified Dunes. At the end of October and early November, we had to hang out around St. George, Utah for a while for some mechanical repairs on our Sprinter campervan. While we were in the area, we decided to check out Snow Canyon State Park. The entrance fee is $10, but being the scheming vandwellers we are, we calculated that as a bargain since we figured we could fill up our water jugs and take a shower in the campground. We succeeded in getting water, but the showers require a code to access them. Nevertheless, we had a great time hiking and enjoying the natural beauty of Snow Canyon. Here are a few places you shouldn’t miss if you are headed to the park. One of the neatest parts about the geology of Snow Canyon is that there is volcanic rock, lava tubes, and extinct cinder cones, alongside water-carved Navajo sandstone and sand dunes. 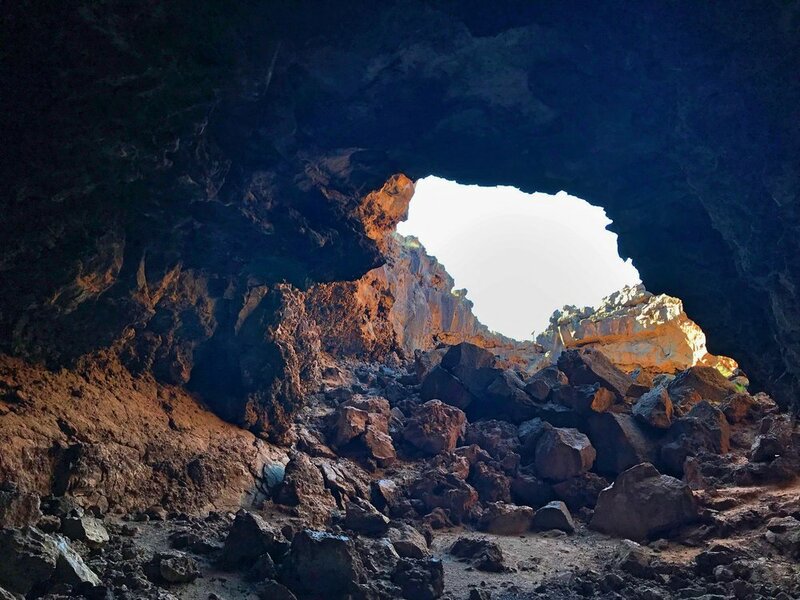 The Lava Flow Trail leads you to some of the coolest volcanic formations in the park—lava tubes! These lava tubes are deep caves, which were once filled with flowing lava, but are now hollow tunnels. Make sure to bring your headlamp for exploring these caves. You can see black lava rock everywhere, but until you are right by the first Lava Tube, you can’t see the massive hole dropping straight into the ground. You have to lower yourself into the first cave to get down in it, but it isn’t too difficult. We reached the first lava tube within minutes of the trailhead. The first tube is the deepest, descending hundreds of feet underground. To get into the tube, you have to lower yourself down onto some rocks that have been piled for that purpose. Once inside the opening, you can enter a massive underground cavern. Inside this cavern you can still see light, but if you choose to continue you’ll need your headlamp or flashlight. From the cavern, we squeezed through a fairly small space that then opens into another large cavern that you can again stand up in. We turned our headlamps off just to feel what it was like without them. It was completely pitch black. Ian checking out the lumpy Cauliflower Aa at the entrance of the second cave. Ian searching for more bats. When we turned our lights back on, there was a bat swooping all around. Ian was already squeezing through another narrow passage trying to reach the center of the Earth, but I was pretty much running back to the entrance. Besides, at this point we were so deep there were arrows painted on the rocks to help you find your way out! I won the cave tug-o’-war we headed out of the tunnel and back to the trail. We passed a second lava tube, but it didn’t appear that there was anyway to enter this tube because it was all a jumble of lava rock boulders. Soon though we reached the third and final lava tube. The second tube you can go in has a much more open, gradual entrance. Kaylee emerging from Lava Tube Number 2. We were able to walk right into this cave, only scrambling over some boulders. The rim of this cave is lines with Cauliflower Aa (pronounced ah-ah) Lava Rock. It’s a specific type of lumpy lava rock that forms when lava is flowing at a medium speed—somewhere between the faster, ropy-looking true Aa flows and the slower Pahoehoe (pronounced Paw-hoey-hoey) rock. Again this tube began with a large cavern that you could explore in several directions. However, it’s not nearly as deep as far as we could tell. We think we reached a dead end in every direction. After the lava tubes, there is also a beautiful overlook along the trail that you can climb to get a great view of the surrounding valley. We scrambled up the layered sandstone formation. It’s like climbing the world’s worst designed set of stairs until you reach the top where you have to scramble up some jumbled boulders. The view from the top is panoramic. In one direction there are some vertical red sandstone cliffs. In the other direction there is the black piled lava rock of an extinct cinder cone. Around the overlook, within the valley are petrified layered sand dunes in red and white striations. The view from the top of the Lava Flow Trail Overlook. Tri-colored sandstone formations on the Lava Flow Trail in Snow Canyon. Another incredible trail in Snow Canyon is the Petrified Dunes Trail. We were able to connect the Lava Flow Trail to the Petrified Dunes Trail by making it a loop with the Red Canyon Road, Red Sands Trail, and the Butterfly Trail. We followed small metal domes up a red Navajo sandstone outcrop that was once a sand dune to the top of the overlook surrounded by more curving layered sandstone formations. The climb to the top of the dunes is kind of steep, but it’s not difficult to walk on. 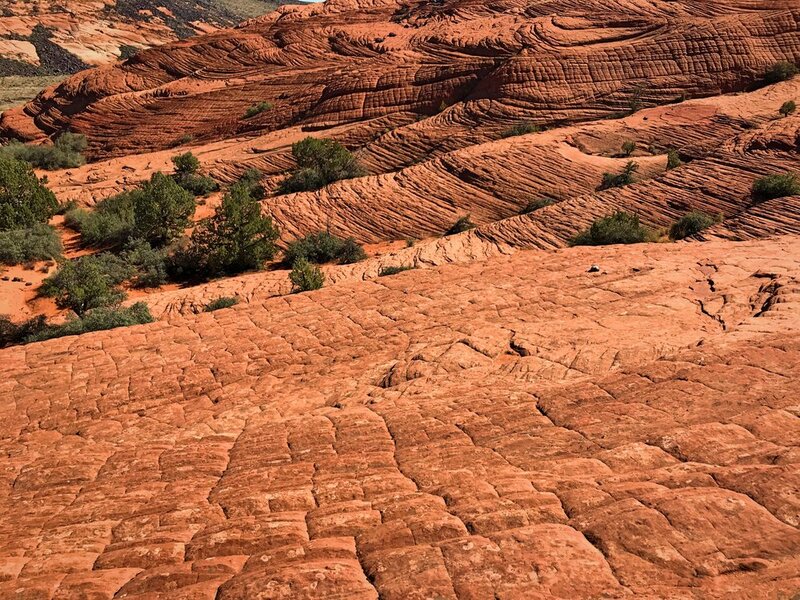 These beautiful layers of red sandstone are sand dunes frozen in time. At the top of the formation the view is gorgeous, but what as even more interesting to us were these little sandstone balls. Some of them were orange but most of them were black. These little iron-coated blobs are often called Moqui Marbles (pronounced mo-key). At the top of the rock they completely coated the ground, and in some places there were formations where the marbles hadn’t totally been separated from the sandstone. The layers of sandstone are all piled at different layers. These crazy little Moqui Marbles are all over the top of the Petrified Dune formations. They were very hard to pick up. Jenny’s Canyon is a super accessible slot canyon. This small slot canyon was an easy half-mile sandy walk from the road. The walls are extremely tall and the red sandstone is carved and honeycombed. In a few places there are even miniature pillars and arches. The sculpted canyon is only a few hundred feet long, but if you look up the sky is still a narrow sliver above you. 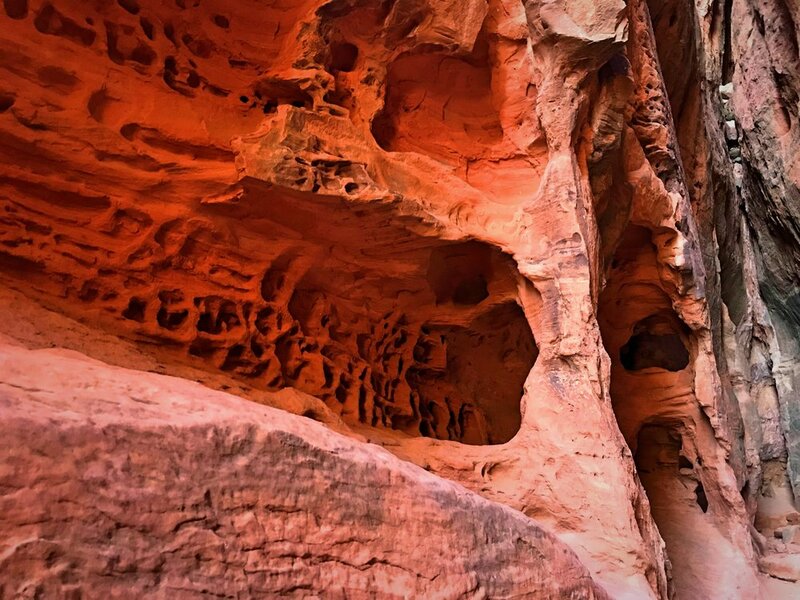 Wind and water erosion have sculpted the canyon’s walls into a honeycomb. Looking up at the sliver of sky above us in the canyon. The walls are a beautiful color when you are inside the canyon looking up. Our last stop before leaving the park was the Pioneer Names hike. The half-mile trail again follows a very loose sandy path, which leads up to a blackened sandstone wall. Along this cliff, you can see anchors for some of the many climbing routes with the park, and if you are lucky maybe you will see people scaling the wall. The namesake of this route though is the old-timey graffiti under an overhang in the sandstone. 19th century Mormon pioneers wrote their names in wagon axel grease, and these names have been preserved for almost 150 years. Hint: Avoid walking on the road during this hike by just making it an out-and-back rather than a loop by turning back at the names. Samuel Wittwer had kind of bad handwriting. Cheesin’ in a keyhole along the Pioneer Names trail. Free camping nearby: The closest free BLM camping location is north of Snow Canyon. There is quite a bit of litter, but there are also Juniper trees to provide shade and privacy. Note: this site was popular with hunters who arrived in droves during the predawn hours when we were there during late October. We better enjoyed camping on some open desert BLM land south of St. George just across the border in Arizona for over a week. It’s cleaner and not as busy as the other site, and as long as you drive away from the highway it’s a lovely quiet spot. Petrified sand dunes topped with lava rock in the middle of Snow Canyon.